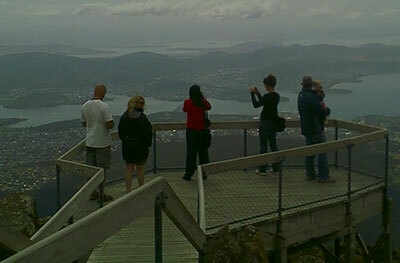 Mount Wellington rises 1270 metres above Hobart. I thought the drive to Mount Wellington from Hobart would take a few hours. Why? 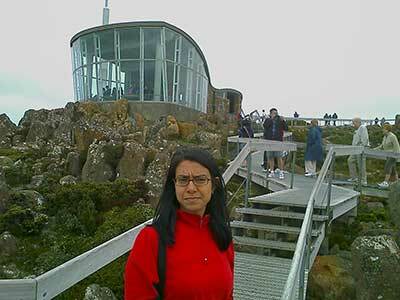 Well, when I compared the city of Hobart to Wellington Park, with its bushwalks and of course, the famous mountain of Hobart, I just got the sense that it would take hours to get there. Not at all. In just thirty to forty minutes, we were there. Driving out of Hobart, we passed Cascade Brewery and the Female Factory. We stopped at Fern Tree Tavern, a delightful pub with lots of interesting history. We admired a photo of the pub and car park covered in snow! And this was taken just a few months ago (2009). We chuckled over a picture of Fatty Appleton, a Cascades Brewery character. He was well-known for being able to lift two beer barrels at the same time. The picture shows him doing just that! As we continued our drive through Wellington Park, heading for the summit, we saw many signs indicating bush walks. We were tempted to stop and do a walk but decided we should keep driving to the summit. And that's what I recommend! At the top, there's an information centre and several viewing platforms. There's a lot to read, and of course, many magnificent views to take in. It's pretty windy at the top. We were very glad we had come equipped with extra layers of clothes! We had planned to do a full walk but the wind made it difficult so we only walked for about half an hour. For me, the Organ Pipes walk would be one of the best walks to do on the mountain. 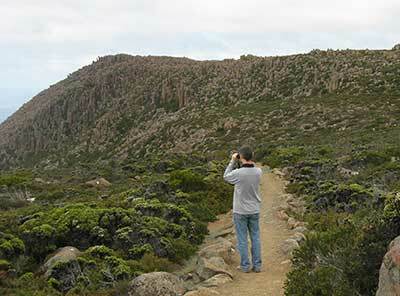 On the walk you get closer to those magnificent dolerite rock formations, known as the Organ Pipes. You might even see some rock climbers! Maybe you'd like to rock climb the Organ Pipes yourself. So how did Mount Wellington get its name? We have the Duke of Wellington to thank. You history buffs will know that the Duke of Wellington defeated Napoleon Bonaparte at Waterloo in 1816. What about Aboriginal names? Yes, there have been a few - Unghanyahletta and Pooranetere. Kunanyi is believed to be the true name for the mountain.